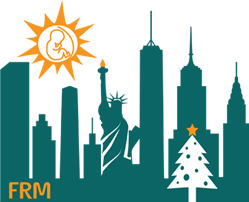 The Foundation for Reproductive Medicine (FRM) is a not-for-profit organization. Our mission is to help families grow by supporting original research and post-graduate medical education in reproductive medicine, with special emphasis in reproductive endocrinology and infertility. Following the success of our 2018 conference, the 4th annual conference of the Foundation for Reproductive Medicine offers to clinicians, basic scientists and trainees in a single lecture hall over two-and-a-half days a comprehensive and very contemporary update on reproductive biology and reproductive clinical endocrinology/infertility. It also presents unique opportunities for interaction between basic scientists and clinicians, with the ultimate goal of the conference being to enhance the quick translation of new developments in reproductive biology to clinical practice in reproductive endocrinology/infertility. Read more and register on the Conference website. In accordance with our mission, FRM issues research grants to investigators pursuing research projects with promising clinical applicability in reproductive medicine and biology. FRM also supports monthly Reproductive Medicine GrandRounds in New York City, jointly with Center for Human Reproduction. A complimentary continuing medical education event, GrandRounds present up-to-date scientific presentation by leading experts in reproductive medicine and sciences to physicians and scientists. FRM's research and educational support offers much-needed funds to advance the horizons of what is possible in basic reproductive biology and clinical reproductive medicine, and for the dissemination of newly developed knowledge. With FMR support, investigators have introduced many innovative new treatments, now used all over the world, to help couples struggling with infertility, and have been able to disseminate their knowledge worldwide. Treatments that were inconceivable only 10 years ago are now possible and utilized in daily practice all around the world.